Les Arenes stalls of the market where visitors can find brightly coloured shawls, skirts and other items in the City of Arles, Provence in France. 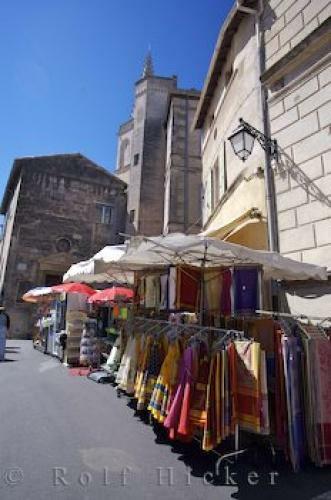 The market stalls outside Les Arenes in the city of Arles, Provence in France, sell brightly coloured items, such as shawls throws and skirts. Markets in Arles have been around for many centuries because Les Arenes, the Roman arena, dates back to the 1st century and it is probable the merchants were selling their wares in the same location then.Market stalls outside Les Arenes in the city of Arles, Bouches du Rhone, Provence, France, Europe. in Arles, Provence in France, Europe.